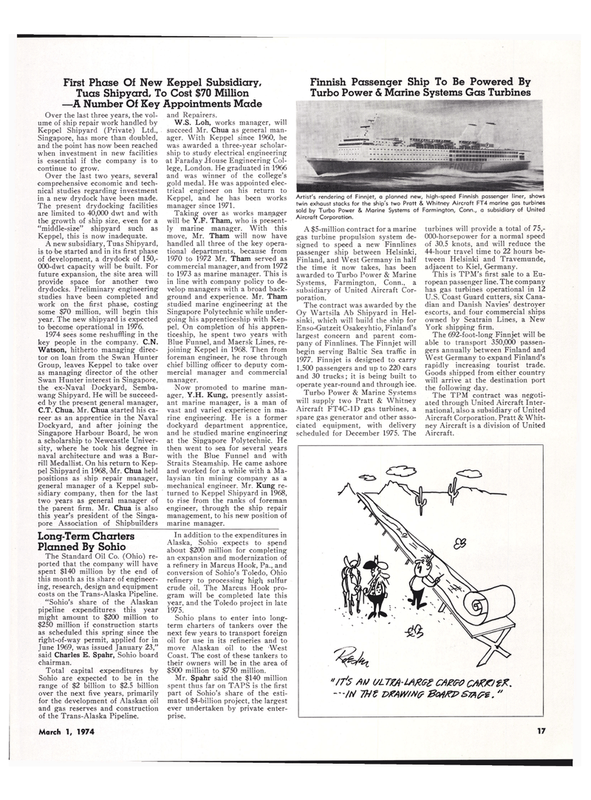 June 1969, was issued January 23," said Charles E. Spahr, Sohio board chairman. Sohio are expected to be in the range of $2 billion to $2.5 billion over the next five years, primarily for the development of Alaskan oil and gas reserves and construction of the Trans-Alaska Pipeline. Alaska, Sohio expects to spend about $200 million for completing an expansion and modernization of a refinery in Marcus Hook, Pa., and conversion of Sohio's Toledo, Ohio refinery to processing high sulfur crude oil. The Marcus Hook pro- gram will be completed late this year, and the Toledo project in late 1975. Coast. The cost of these tankers to their owners will be in the area of $500 million to $750 million. Systems, Farmington, Conn., a subsidiary of United Aircraft Cor- poration. Enso-iGutzeit Osakeyhtio, Finland's largest concern and parent com- pany of Finnlines. The Finnjet will begin serving Baltic Sea traffic in 1977. Finnjet is designed to carry 1,500 passengers and up to 220 cars and 30 trucks; it is being built to operate year-round and through ice. Aircraft FT4C-1D gas turbines, a spare gas generator and other asso- ciated equipment, with delivery scheduled for December 1975. The turbines will provide a total of 75,- 000-horsepower for a normal speed of 30.5 knots, and will reduce the 44-hour travel time to 22 hours be- tween Helsinki and Travemunde, adjacent to Kiel, 'Germany. West Germany to expand Finland's rapidly increasing tourist trade. Singapore, has more than doubled, and the point has now been reached when investment in new facilities is essential if the company is to continue to grow. Over the last two years, several comprehensive economic and tech- nical studies regarding investment in a new drydock have been made. Keppel, this is now inadequate. A new subsidiary, Tuas Shipyard, is to 'be started and in its first phase of development, a drydock of 150,- 000-dwt capacity will be Ibuilt. For future expansion, the site area will provide space for another two drydocks. Preliminary engineering studies have been completed and work on the first phase, costing some $70 million, will begin this year. The new shipyard is expected to 'become operational in 1976. 1974 sees some reshuffling in the key people in the company. C.N. Singapore Harbour Board, he won a scholarship to Newcastle Univer- sity, where he took his degree in naval architecture and was a Bur- rill Medallist. On his return to Kep- pel Shipyard in 1968, Mr. Chua held positions as ship repair manager, general manager of a Keppel sub- sidiary company, then for the last two years as general manager of the parent firm. Mr. Chua is also this year's president of the Singa- pore Association of Shipbuilders and Repairers. Keppel, and he has been works manager since 1971. Blue Funnel, and Maersk Lines, re- joining Keppel in 1968. Then from foreman engineer, he rose through chief billing officer to deputy com- mercial manager and commercial manager. Straits Steamship. He came ashore and worked for a while with a Ma- laysian tin mining company as a mechanical engineer. Mr. Kung re- turned to Keppel Shipyard in 1968, to rise from the ranks of foreman engineer, through the ship repair management, to his new position of marine manager. «t?S AM ULTZA-IAKGZ CMM CAZftfK. -7N 7HZ VZAW/Mfr S7A&2. "